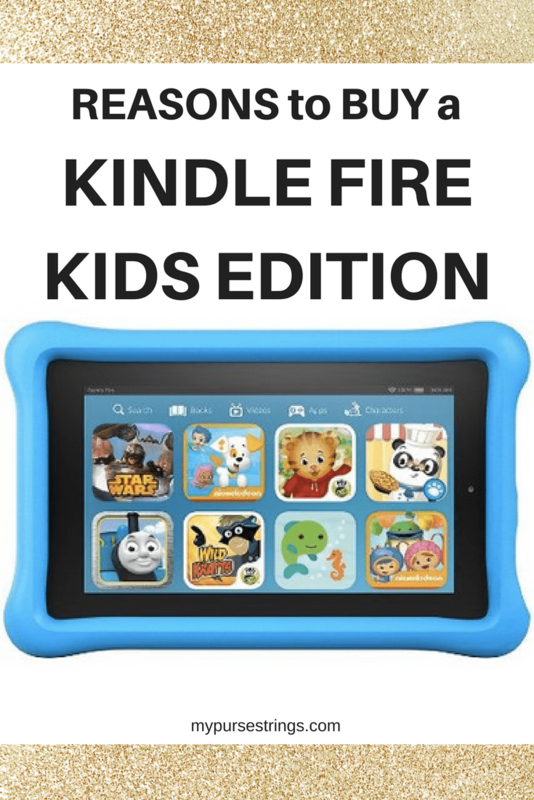 The [easyazon_link identifier=”B018Y226XO” locale=”US” nw=”y” tag=”mypurstr-20″ cart=”n” popups=”n”]Kindle Fire Kids Edition[/easyazon_link] has books. Tons of them. When you buy a Fire (Kids Edition), you receive one year of FreeTime Unlimited. *FreeTime Unlimited is a subscription service geared towards children ages 3 to 12. Parents set up an individual profile for each child and specify their ages. It’s free for the first year but you will have to pay a monthly fee thereafter. As an Amazon Prime Amazon Prime member, I’m currently paying less than $3.00 per month per child. When you think of the price of books, it pays for itself almost immediately. FreeTime Unlimited includes access to kid-friendly books, movies, TV shows, educational apps, and games. My son, a second-grader, has begun to read for fun (and not because he has to do it). After a year of bringing home [easyazon_link identifier=”006228360X” locale=”US” nw=”y” tag=”mypurstr-20″ cart=”n” popups=”n”]Big Nate[/easyazon_link] books from the school library, we discovered the entire series preloaded onto his Kindle. When his teacher assigned him a research paper on tigers, I downloaded three books in a matter of seconds. And he’s finally old enough to read the [easyazon_link identifier=”0545162076″ locale=”US” nw=”y” tag=”mypurstr-20″ cart=”n” popups=”n”]Harry Potter[/easyazon_link] series with me, also on his Kindle. It’s like having an entire library at our fingertips, with new age-appropriate books added daily. Unlike Apple devices, parents can pre-set time limits for their children: how long they can use the Kindle, when they can start playing in the morning, and when it shuts itself off at night. I am no longer the bad guy. No more asking, reminding and demanding that they stop playing their electronics. It’s simple: time is up and the Fire shuts down. My favorite feature enables me to require my kids to read for a specified amount of time per day before they can watch videos or play apps. Even my kindergartner must flip through the pages of a book on her Kindle or listen to an audio book for at least 15-minutes. Parents can change these limits at will and differentiate weekday limits from weekends. The Fire sells for a fraction of the price of an iPod touch or iPad. Plus, you get a rugged kid-friendly case, a year of FreeTime, and a two-year no questions asked warranty at no additional cost. Over the years, my kids have managed to shatter the screens of my Mac, iPad, and iPhone. Knowing that Amazon will repair or replace the Fire for any reason at all within the first two years gives me peace of mind. When our kids watch YouTube videos or shows on the internet, we can never be quite sure of what they are watching. And, that’s a scary thought. The FreeTime subscription provides access to videos and shows appropriate for their age. My son’s Kindle features educational PBS shows such as Nova and Wild Kratts. Although you need Wi-Fi to stream video, you can buy videos and download them to your device to watch offline. I’m not going to tell you that Amazon’s apps rival Apple. My son can’t play his favorite game, Minecraft on his Kindle Fire. But when he’s using his Kindle Fire, I know that the games have an educational component to them. Many of the games focus on math or vocabulary skills. We have the [easyazon_link identifier=”B00X4WHP5E” locale=”US” nw=”y” tag=”mypurstr-20″ cart=”n” popups=”n”]Amazon Echo[/easyazon_link], [easyazon_link identifier=”B01DFKC2SO” locale=”US” nw=”y” tag=”mypurstr-20″ cart=”n” popups=”n”]Dot[/easyazon_link], and [easyazon_link identifier=”B00ZV9RDKK” locale=”US” nw=”y” tag=”mypurstr-20″ cart=”n” popups=”n”]FireStick[/easyazon_link] at home and my children use Alexa all the time. Now, they can access the Alexa app on their Kindle Fires. With the touch of a button, they can ask Alexa the weather, to play a specific song or artist, or to answer a question. This ability to request information on their own gives my kids (who are not yet internet savvy) a sense of independence. Honestly, I have a love-hate relationship with my children and electronics. My kids clearly get addicted to their devices. I want my children to develop a deep love for books like I have and to make reading a priority. To me, the Kindle Fire is another way to encourage reading and to motivate them to read more. Note: As an Amazon Affiliate, I receive a small fee if you make a purchase through one of my links. I only write about products I use and love. Stay tuned for my upcoming post on Kindle Fire Kids Edition summer reading lists. As always, I love hearing from you. Maybe true, but I CANNOT figure out how to download videos and watch them offline with the Kindle fire, so it is useless for my main goal — watching videos while traveling!